Your sofa and your nerves are in tatters. You're scolding your cat, knowing all the while that it's futile. This is not a cocker spaniel that you're dealing with. This is one of nature's most pragmatic and self-sufficient creatures: a cat. Worse, you're well aware that your cat considers your behavior baffling. She looks at you as if you've gone slightly mad. "Why the Fuss?" she seems to say. "What are you raving about? I'm simply doing my thing — what's up with you?" You're at an impasse. What to do? Please, take this as a given. Declawing is not an acceptable option for the beautiful, loving animal that depends on you. The reasons to avoid declawing are compelling, for you as well as for your cat. Declawing is literally maiming a cat, a mistake that can lead to physical, emotional, and behavioral complications. It is erroneous to think that declawing a cat is a trivial procedure similar to trimming fingernails. A cat's claws are a vital part of her anatomy, essential to balance, mobility, and survival. On rare occasions, declawing may lead to secondary contracture of the tendons. This makes it uncomfortable for the cat to walk. Since the last joints of her front paws are missing, she compensates by placing more of her weight on her hindquarters, causing her to be out of balance. This shift of weight to the back feet may lead to atrophy of the muscles of her front limbs and strain injuries to the back ones. Being out of balance is extremely distressing to a cat, whose very life is about balance. You've observed cats climbing trees, teetering perilously on a single branch, leaping incredible heights to land on a pre-selected spot, or threading in and out of complex arrangements of knickknacks without disturbing a single ornament: unless, of course, they choose to do so. These are acts of balance and part of a cat's basic heritage. In addition to being an intrinsic part of a cat's normal conformation, her front claws are her primary defense. Once declawed, there is no replacement or regrowth of the claws. You may think, "My cat never goes outside." But what if your cat accidentally gets outside and you can't find her? She is now defenseless in a potentially hostile environment. Deprived of her front claws, a cat may become insecure and distressed. I can assure you that if your kitty becomes emotionally distressed, you will too. A cat's display of distress tends to take such forms as urinating on your favorite rug or spraying your antique armoire. Feeling defenseless without her claws, your kitty may become hostile to people, including you, and to other cats; becoming more apt to bite. Some cats develop an aversion to their litter box because of the pain associated with scratching in the litter after a declawing procedure. If your kitty doesn't go in the box, she will find a more comfortable place to do her business. Often times, these habits are hard to break. One more compelling reason not to declaw: Some European countries have ruled declawing illegal! It is considered inhumane. For more information on declawing, please visit www.declawing.com. Now it's time to lighten things up and provide you with some solutions. Understanding the situation is half the battle. You and your cat are about to teach each other some valuable lessons. This isn't exactly a revelation, since you probably have the evidence everywhere — in the tattered corners of your sofa, the shredded drapes, and your frayed nerves. Though your kitty's natural propensity for scratching may not be big news, it is a fact that you'll need to take into account if you're going to make any headway in winning the battle to keep her from scratching in places you consider undesirable. What you can do is stop her from scratching those items you value and want to keep in their relatively pristine state. Bear in mind Mark Twain's advice, which applies universally: Never try to teach a pig to sing; it frustrates you and annoys the pig. Translate this bit of wisdom to your dealings with cats, and you'll avoid a good deal of futility and frustration. You can't make a cat do anything she doesn't want to do. Get clear on that. And getting her to stop doing something she enjoys is just about as difficult. Therefore, you have to think smart and re-channel her desires. A Word About Punishment — Don't do it! Cats don't understand physical punishment. In addition to it being wrong to hit your cat, punishment simply doesn't work and is likely to make your situation worse. Clever though your kitty is about many things, she won't understand that you're punishing her for scratching the couch. She will only compute that sometimes she is treated badly. This may make her insecure and stimulate her to scratch more or develop other undesirable behavior problems. Eventually, you will break the trust and security that is the basis for your cat's relationship with you, and you will find it very difficult to catch her for any reason at all. Cats have excellent memories and hold serious grudges. Lesson 3: Why Do Cats Scratch? More to the point, why do they scratch your prized possessions? Understanding your cat's need to scratch is more than just an act of charitability on your part. It's the key to channeling your kitty's efforts to more acceptable areas. To mark territory. Scratching is a territorial instinct by which cats place their mark and establish their turf. Through scratching, cats mark their domains with more than just visible signs of claw marks. Cats' paws also have scent glands that leave their own special message on their territory. And this is why they mark the most visible portions of your house. It's your kitty's way of adding her own personal touch to your (and her) home. It's her version of interior decorating. For exercise. Scratching also serves to keep your cat in shape. The act of scratching stretches, pulls, and works the muscles of a cat's front quarters — a cross between a feline gym workout and Kitty Yoga. For sheer pleasure. Hey! It feels good to scratch! So, give up the idea of reforming your kitty's desire to scratch. Re-channel her into scratching where you want her to. You'll both be happier. For more information, check out this article: "Why Cats Scratch." Since your cat brings you so much joy, you decide to buy her the softest, prettiest, and most luxurious scratching post you can find. You take it home, and your feline friend gives you a blank stare and walks away. This activates your parental guidance mechanism, and you decide to show her how to use the post by taking her front paws and making scratching motions at the post. She, of course, struggles till she gets free of you and then treats you with utter disdain for the rest of the day. Never make the mistake of trying to "show her how" to scratch anything. You'll only offend her. She knows perfectly well how to do it. She just reserves the right to scratch when and where it suits her. Bear in mind that your idea of desirable and your kitty's may not coincide. Cats like rough surfaces that they can shred to pieces. The cat scratching post with the most aesthetic appeal to your cat is often a tree stump, though this is a bit unwieldy in a one-bedroom apartment. Whatever post you choose, it must be tall enough for her to fully extend her body, and most important, it must be secure. If it topples over even once, she won't go back to it. Sisal scratching posts are ideal for releasing your kitty’s primal urges. This is a material she can shred to pieces with great satisfaction. I am referring to the sisal textile material, not the sisal rope. Sisal material has a perfect texture and grain for a cat to shred, and that is what she wants to do. Studies have shown that most cats prefer to mark their territory with vertical shredding marks; sisal textile provides the perfect surface for this behavior. Be sure not to throw it away when it is shredded, since that’s when she’s broken it in satisfactorily, and she will not appreciate your tidiness. A good post should be tall enough for your kitty to fully stretch her body, usually at least 28 inches tall, and it should be very stable. An excellent example of an exceptional scratching post is the Purrfect Post. You can learn more about how this subject here: "How to Choose the Best Cat Scratching Post." The reverse side of rugs provides a good, satisfyingly resistant texture for clawing. You can place a piece of rug material over an area of carpet where your kitty has already been scratching. However, it must be stationary. Secure it so it doesn't move by duct taping the edges or placing it under furniture. You can also staple pieces of rug to a wall or post. Remember that an important part of scratching is the cat's desire to mark territory, so a scratching post should be in an area that's used by the family, not hidden in a back corner. After a time, you can move the post away to the periphery of the room, but you'll need to do this gradually. Initially, put the post where your cat goes to scratch. This may be by a sofa, a chair, or wherever your kitty has chosen as her territory, and you may need more than one post to cover her favorite spots. Security is a major factor in making the post appealing to your cat. If it topples or shakes, she won't use it. It should either be secured to the floor or have a base that's wide and heavy enough to keep it stable. Encourage your kitty to use her post with clever enticements. Feed her and play with her by the post. Rub dried catnip leaves or powder into it. Make all the associations with the post pleasurable. Reward her with a favorite treat when she uses it. Have her chase a wand toy around the post or attach toys to it, which will result in her digging her claws into it. Eventually, she will learn to love the post and regard it as her own. It's also a good idea to put a post where your kitty sleeps. Cats like to scratch when they awaken, especially in the morning and the middle of the night. If space permits, a scratching post in every room of the house is a cat's delight. The most important place is the area of the house in which you and your cat spend the most time. I have many sisal posts in my house yet often, in the morning, my cats line up to use the one in the living room. If at first your kitty is reluctant to give up her old scratching areas, there are means you can use to discourage her. Covering the area with aluminum foil or double-sided tape is a great deterrent. These surfaces don't have a texture that feels good to scratch. Remember, too, that your kitty has marked her favorite spots with her scent as well as her claws. You may need to remove her scent from the areas you want to distract her away from. Enzymatic pet odor cleaners work well for this. Cats have an aversion to citrus odors. Use lemon-scented sprays or a potpourri of lemon and orange peels to make her former scratching sites less attractive to her. If your kitty still persists in scratching the furniture, try squirting her with a water gun or a spray bottle set on stream. Another option is a loud whistle or other noisemaker. You must employ these deterrents while she is scratching for them to be effective. The point is to establish an aversion to the spot you don't want her to scratch. You can find more information and tips in this article: "How to Train Your Cat or Kitten to Use a Scratching Post." If you are starting with a kitten, consider yourself fortunate. It's much easier to initiate good habit patterns than to correct undesirable ones. From the beginning, teach your kitten the appropriate place to scratch. Use the methods already described, especially playing around the scratching post to capture her interest. Take advantage of your kitten's desire to play and attach toys to the post. She will soon "dig in" to catch her toy and discover how good it feels to scratch this surface. Do not take her paws and make her scratch the post. This is a major turn-off and will only inspire a bratty "you can't make me" attitude. Even at an early age, cats refuse to be coerced into doing what they don't want to do. If your kitten starts to scratch an inappropriate object, immediately place her in front of her scratching post and begin petting her. Some cats will begin kneading when petted, thus digging their claws into the desired surface and establishing this as a fine place to scratch. If you're looking for some alternate ways in which you can mitigate the negative results that may occur from your cat's scratching, we have some options. Though you should never declaw, you may defray some of your cat's potential for destruction by carefully trimming the razor-sharp tips of her claws. You will find this endeavor to be more easily accomplished by two people; one to hold the kitty and one to trim her nails. 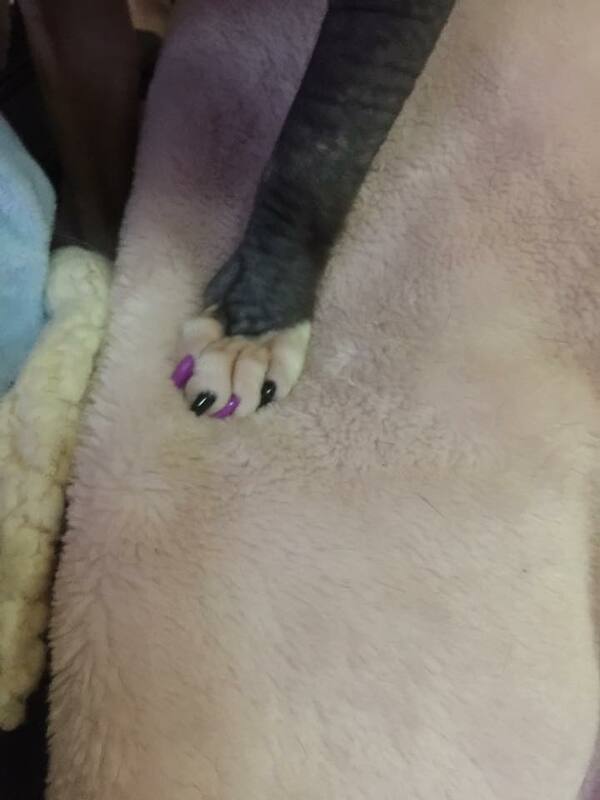 Though she enjoys other forms of pampering, your cat will probably not find a manicure soothing. Gently hold your kitty's paw in one hand and with your thumb on top of the paw and your forefinger on the pad, gently squeeze your thumb and finger together. This will push the claw clear of the fur so it can easily be seen. You will notice that the inside of the claw is pink near its base. This is living tissue that you do not want to cut. Trim only the clear tip of the nail. Do not clip the area where pink tissue is visible nor the slightly opaque region that outlines the pink tissue. This will avoid cutting into areas that would be painful or bleed. The desired effect is simply to blunt the claw tip. Many different types of nail trimmers are available in pet stores, but I find human toenail clippers easy and effective to use. If by now you're rolling on the floor laughing because you know your cat isn't about to let you trim her claws, here are a couple of guidelines that will help make this a possibility: patience and preparation. Rushing into a full-scale claw trimming is a foolhardy move unless you're really into operatic drama and traumatic events. As you well know, cats hate to be restrained. And they don't like you fooling with their paws, which comes across as threatening. After all, their claws are a major tool for survival, and your kitty may consider your motives suspect. This is where preparation comes to the rescue. For approximately a week before her manicure, begin getting your kitty accustomed to having her paws handled. While petting and soothing her, start massaging her paws, especially on the underside. Gently press on the individual pads at the base of her claws. You may want to give her treats to reward her for not protesting or to distract her from doing so. The point, of course, is to make the process reassuring so that she will eventually feel comfortable enough to let you handle her paws without protest. Next, be patient. Don't attempt to trim all of your cat's claws at once. Trim one or two at a time, reward her with affection or food, and then let her do as she wishes. Cats are not strong on patience or compliance with restraint. As the creature theoretically higher on the evolutionary scale, that's your department. Don't attempt to change your cat. Instead make the situation tolerable for her. Eventually, trimming will become a completely non-traumatic experience. For a more detailed explanation and pictures of how to trim your cat's claws, click here. If all of this is too time-consuming and you have a strictly indoor cat, you have another very desirable option; a wonderful product called Soft Paws®. These are lightweight vinyl caps that you apply over your cat's own claws. They have rounded edges, so your cat's scratching doesn't damage your home and furnishings. You can find Soft Paws® on the web by clicking here or you can call 1-800-989-2542. Soft Paws® are great for households with small children because they guard against the child getting scratched. They are also extremely useful for people who are away from home all day and simply can't apply the watchfulness necessary to train a cat to use a scratching post. An important caveat here, however; they should be used only on indoor cats, since they blunt one of the cat's chief means of self-defense. Soft Paws® last approximately six weeks once your kitty becomes accustomed to them. At first, they may feel a bit strange to her and she may groom them excessively, causing them to come off sooner. She'll get used to them quickly though, and thereafter they will last longer. It is amazing how well cats tolerate the Soft Paws®; most don't even notice they are wearing them. 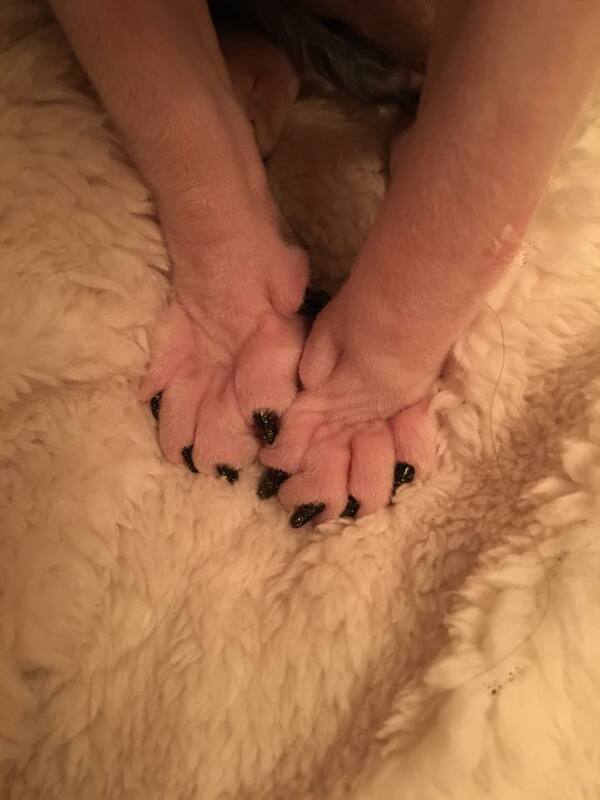 Soft Paws® come in a kit and are easy to apply. Just glue them on with the included non-toxic adhesive. They are generally applied to the front paws only, since these are what cause most of the destruction to your home. A kit will last approximately three to six months, depending on your cat. After applying the Soft Paws®, check your kitty's claws weekly. You may find one or two caps missing from time to time, and these are easily replaced using the adhesive included in the kit. To make application easier for both you and your cat, follow the instructions above on getting your cat used to having her paws handled. The great majority of cats tolerate Soft Paws® well. The brattiest of my own cats, a princess who is hyper-fastidious, wears them with aplomb. On her, by the way, one Soft Paws® kit last at least five months.